This App is an absolute blessing for those who love to dine out, like me and the mister. With over 500 buy-one-get-one offers ranging from high-end restaurants to casual dining, cafes, nightspots, informal dining, attractions, sports, water parks, golf courses and more. Mostly, we use it for dining. We recently used it at The Butcher Shop and Grill at Villagio for a dinner meal. This was our first time to use the app version, as we have purchased the booklet for 2014. 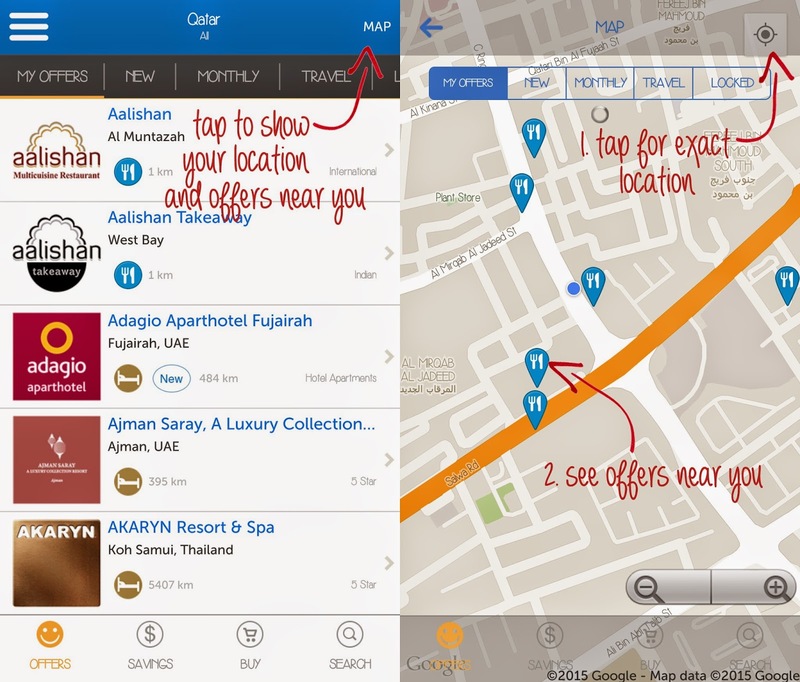 The good thing about the app is that you can choose depending on your location, you just have to tap on MAP and it will show you offers near you (of course, you have to turn the GPS on your mobile). 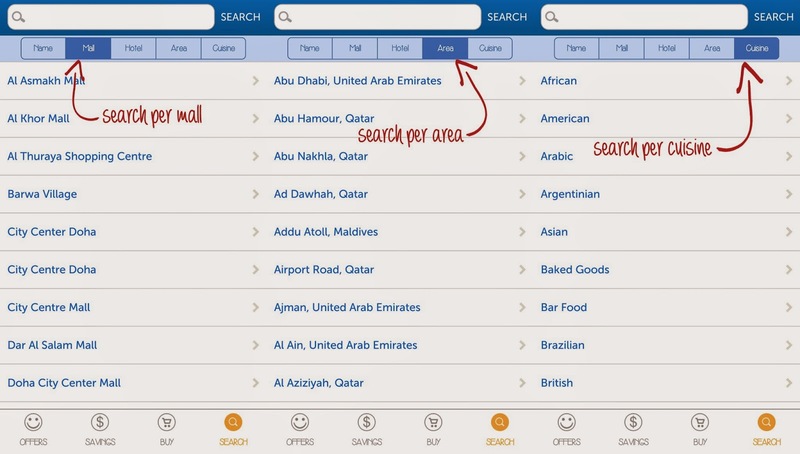 You can also search from list of malls, areas and cuisine. Just tap on SEARCH and you choose an option. 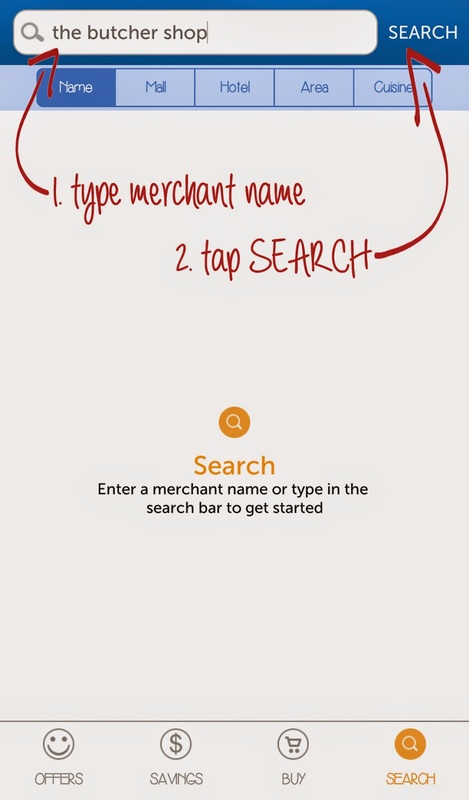 You can also search directly for a merchant. 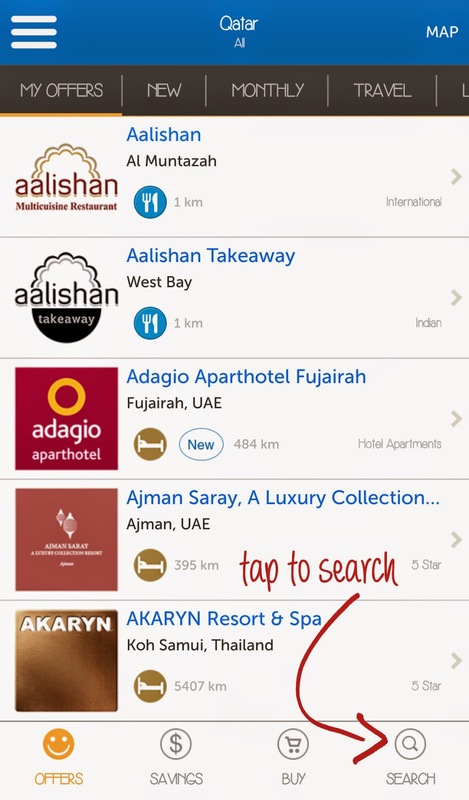 You can also save some of your favorite restaurants/places, just tap on the STAR on the page of the restaurant and it will automatically show on your FAVORITES list. Once you're in a particular page, you can see the offers available (usually there would be three offers per page), choose from one. 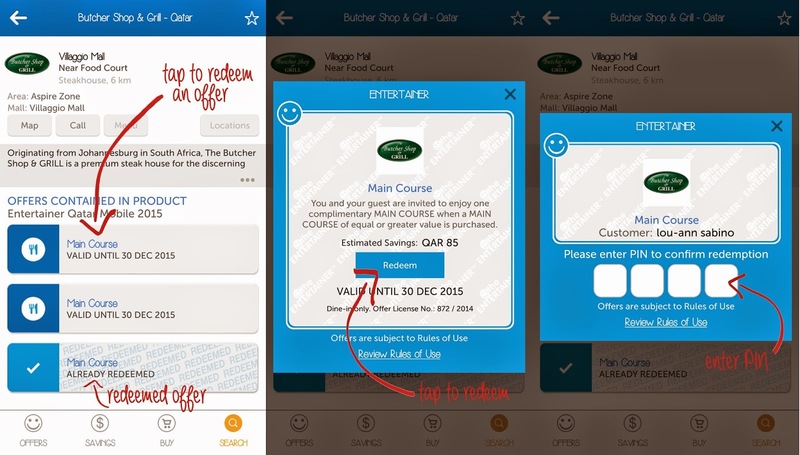 Coupons you've used will be seen with with the word REDEEMED. 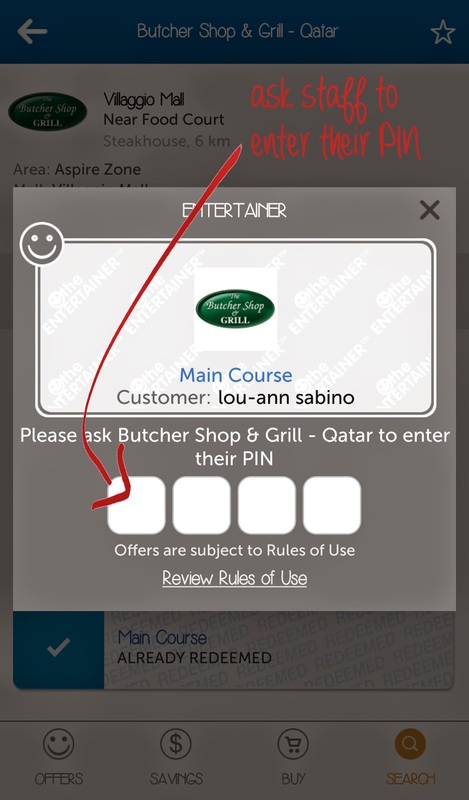 A new window will pop-up containing the offer, tap REDEEM, and you will be asked to enter your PIN which you will have registered upon buying the app. After your PIN, another window will pop-up asking for the store's PIN, at this point you have to hand it to the staff of the particular restaurant and they will enter their PIN. A code will appear which they will use to deduct the free meal from your bill. And viola! You just got two meals for the price of one. What I like about the App is that it also calculates your savings. Just tap on SAVINGS on the bottom of the screen and it will calculate your savings. It's not quite exact though, for example; my husband's meal was QR99 and mine was QR95, so generally we will pay for the QR99. 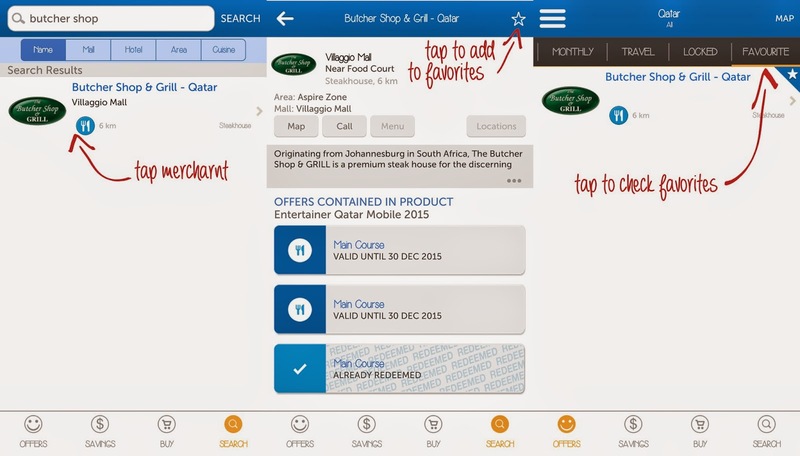 But the App says that we saved QR85 for this particular purchase. I think they input the price of the least amount in their menu items. So what I do is I just take note of our savings on a separate note/reminder app, just for keeping track. 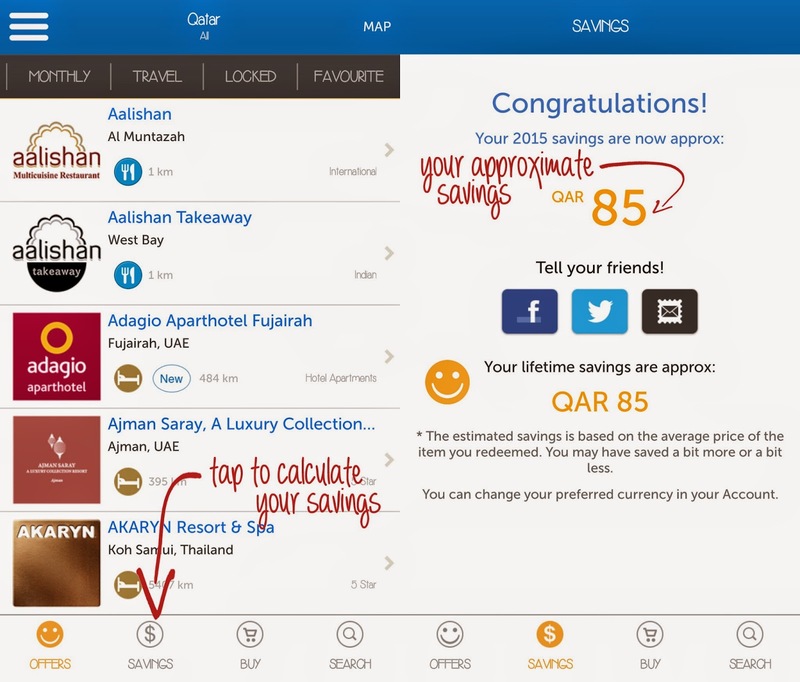 We bought the App for QR265 and already saved QR95 on the first use, and it's just January. Can you imagine how much we'd save at the end of the year. I really think it's a great value for your money, of course it depends upon where you usually use it. We mostly use it for eating out. The book is quite bulky and it costs QR350, but the app is just for QR265. Yes let's do that soon.